Even before you start scrolling down this post, I must tell you that you will surely end up creating your own Google Search Story. Google Search Story is an application where you can create story from Google Search results and then directly upload to YouTube. This is an innovative way by which Google promotes its search engine and also help users create their own search story using “Google Search Story Video Creator”. How to create your own Google Search Story? Creating your own Google Search Story is very easy and I have listed below steps following which you can create your own search story. Go to Google Search Story Video Creator and Click on “Create you own” button. Next you will be taken to a Write screen where you have to decide & write the search strings for which you want to create a search story. 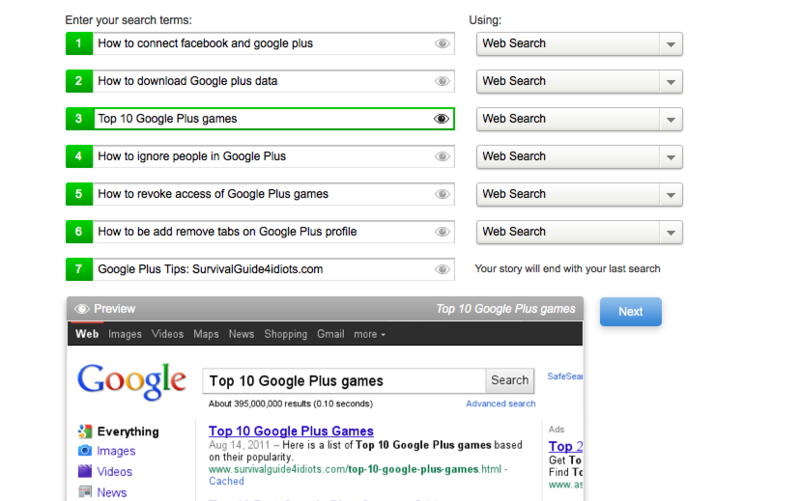 You can create a search story using websearch, images, maps, news, blog search, product search etc. For every search string you enter, Google search results will be shown in preview section. You would have to add minimum of 5 search strings to create Google Search Story. You can choose background music for your video by clicking the track button numbered from 1 to 3. 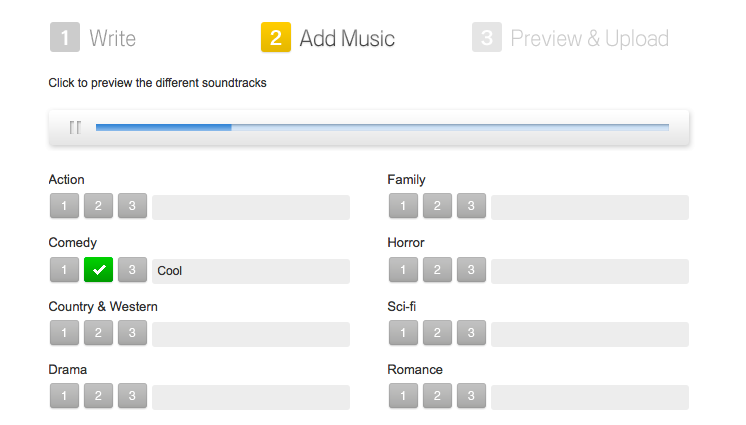 Once you click the button, music will be played so that you can listen to different tracks before choosing a track for you video. Click Next once you are done with your Selection. In the Preview section, you can preview your Google Search Story Video, add title and description to your video. After finishing up all these fields, you can directly upload this video on YouTube and share it with your friends. Below is the sample video which I created for our website and as you might have noticed our website has top results for most of Google Plus articles. Don’t forget to visit my profile on Google+ and add me & +Apurva Tripathi to your circles on Google+ for Google+ tips and other amazing stuff.